SEE MORE: What Are the Benefits of a Smart Lighting Control System? One way to automate your thermostat is by using schedules. Program your thermostat to raise the temperature when you expect to be at work, then lower it again to a cooler setting when you return. Some clients also like to lower the temperature at night to sleep more comfortably. One of the benefits of a smart thermostat is that it can learn from your routines; if it notices you’re making adjustments at a given time every day, it can begin making them automatically. Motion sensors are great pieces of technology to help you save energy. The sensors detect movement and then communicates that information to your home system to shut off lights, turn them on, or raise or lower your thermostat. You’ll never have to worry about wasting electricity cooling down unused room. Door and window sensors are an excellent way to avoid energy waste. As the temperatures dip in Texas, you may be tempted to keep windows open to cool down your home. Program your thermostat to turn off as soon as a door or window has been left open for an extended period so that it's not blowing cold air out of your home. 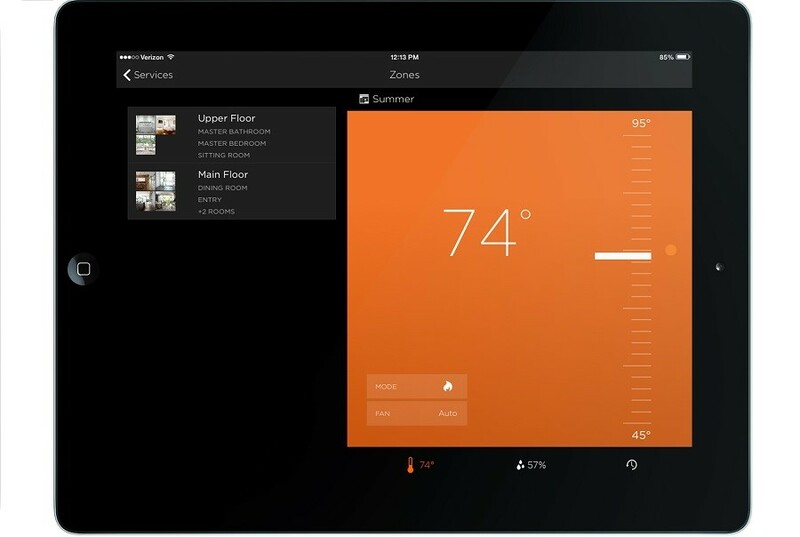 Your thermostat also partners with other technology in the home to be more efficient. Motorized shades are a great climate control partner. You can program shades to close automatically during the hottest times of the day to help cool down your home. Your climate control can also be linked to your security. Program your thermostat to go off energy-saving mode and begin lowering the temperature as soon as you open the front door or disarm your security system. From a smartphone, touchpad or tablet, adjust the temperature in your entire home or a specific room. You can also access your thermostat while on the go. When you’re ready to head home, you can pull up your phone to lower the thermostat to ensure it has cooled down by the time you arrive. From your user interface, you can also access energy dashboards. These let you know which rooms are taking up the most energy and at what time. You can then program the necessary adjustments to make sure you're saving as much energy as possible. A comprehensive climate control system makes it easy for you to keep your family comfortable at all times while lowering your carbon footprint. To find out which solution would make the most sense for your home, feel free to contact us at our Boerne or San Antonio locations.